We love to review things here at Foodshack and today we thought we would take a look at one of the kitchen gadgets that generally ends up in the back of the cupboard. We have all at some time owned a sandwich toaster and made some amazing cheese toasties, been through the stress of cleaning the toaster machine and then put it back in the cupboard to gather dust! Maybe this is not you? You might be one of those rare people that love their toasties. Maybe you have a lot of fantastic toastie recipes you could share! For some the sandwich toaster is often a memory of our distant student past, toasties have always been the ultimate no-fuss snack. They can be prepared in seconds and ready to eat in just a few minutes. With just a couple of basic ingredients, delicious economical meals can be made in minutes. The toasted sandwich also can be used for sweet toasties. 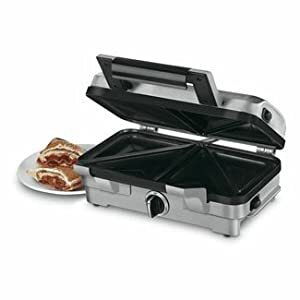 For real Toastie lovers why not treat yourself to Toastie Heaven: 100 great reasons to dig out the sandwich toaster . Toastie Heaven explores variations from the conventional, to the extravagant, quirky and indulgent. From classic toasties like Tuna, Sweetcorn and Pepper Melt, to vegetarian options like Brie, Redcurrant and Watercress toasties and even sweet desserts like Bread and Butter Pudding Toasties and Toffee Apple Toasties, there is a recipe for everyone. A must-have item perfect for people living on their own, children and students,Toastie Heaven is the ultimate book for anyone wanting quick and tasty snacks with minimum effort and maximum taste.